Covering a sparkling assortment of shapes and styles, this all-original collection is perfect for hard-to-fit windows or wall spaces. Simple patterns include Apple Blossoms, Man in the Moon, Fish Pond, Agate Abstract, Peacock, Hummingbirds & Butterfly, and many more. 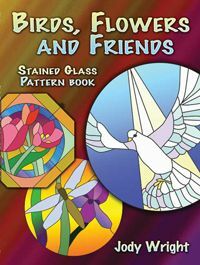 Includes: 60 round, oval, and octagonal designs with enlargement guide and helpful hints.